A breakfast cereal or snack usually consisting primarily of cooked dried grains and sweeteners such as honey, brown sugar or maple syrup. Oat-based granolas tend to be the most popular. 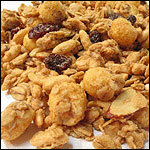 Granola may also include dried fruit, nuts and a multitude of other ingredients. While some granola recipes require no cooking at all, most are baked until crispy. Granola is often eaten while camping or hiking because it is lightweight, high in energy and it stores well. 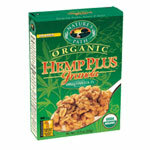 In the late 1960's, granola was very popular with hippies who appreciated the food for its all-natural ingredients. This association with hippies resulted in an alternate definition of granola. Today, the word "granola" is also used to describe hippy-like personality traits (i.e. "That girl is real granola").